If you’ve not managed to get sucked into the world of Tyria over the last year or so, then a great little deal from NCSoft may have you diving for the login page. This Sunday, 20th October, Guild Wars 2 is missing 40% from its normal price, making the hours of incredible MMO gameplay it can provide even more tempting. The deal is available across UK, Europe and US regions, and applies to both the Standard and Deluxe packs. English gentlefolk may pick up the Standard Edition at £20.99 instead of £34.99, and the Digital Deluxe pack at £29.99 instead of 49.99. The elegant citizens of Europe may enter Tyria for a charge of just €23.99 for the Standard instead of €39.99, and €35.99 for the Digital Deluxe instead of €59.99. North American nationals can grab the Standard Edition for $29.99 instead of $49.99, and the Digital Deluxe for $41.99 instead of $69.99. The deal starts from 3pm PDT on the 19th October and concludes at 11.59pm PDT on the 20th October. The deal will be available from the Guild Wars shop. 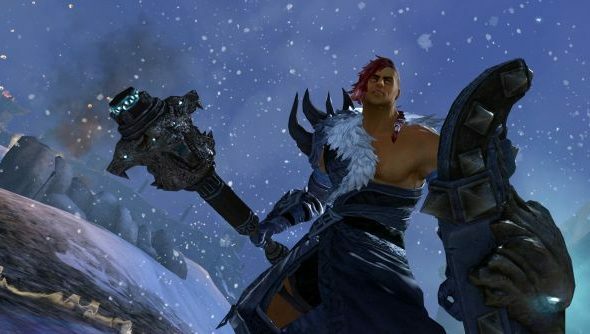 All of us at PCGamesN are fond of Guild Wars 2, and if we hadn’t all feverishly picked it up at launch, we’d probably be clamoring at this deal. If you’ve been waiting to try out an MMO, Guild Wars 2 is where you should start, and with a decent price and no subscription fees, we don’t hesitate to recommend this. You could even join our Guild Wars 2 guild.